My eldest boys had swimming this morning and have both come back absolutely shattered. I think their first week back at school after the Easter break has caught up with them. When my youngest went down for his nap neither of them had much enthusiasm to do anything other than lie on the sofa asking for their 8th snack of the day. Quick activity and Pinterest to the rescue! Homemade cling film wax wraps. These can be done with beeswax pellets or soy wax pellets. I’ve got soy pellets in from the last time I made these, this also makes it vegan friendly too which is a bonus. They both chose some cotton fabric from my stash. Rather hilariously they both went for the Winter/Festive prints. Rather appropriate for yet another dreich day in not so Sunny East Scotland. Firstly they cut out (I helped) various shapes while the oven preheated, I made a banana bread afterwards so I just put it on 160 degrees ready for that. A medium temperate is all you need. 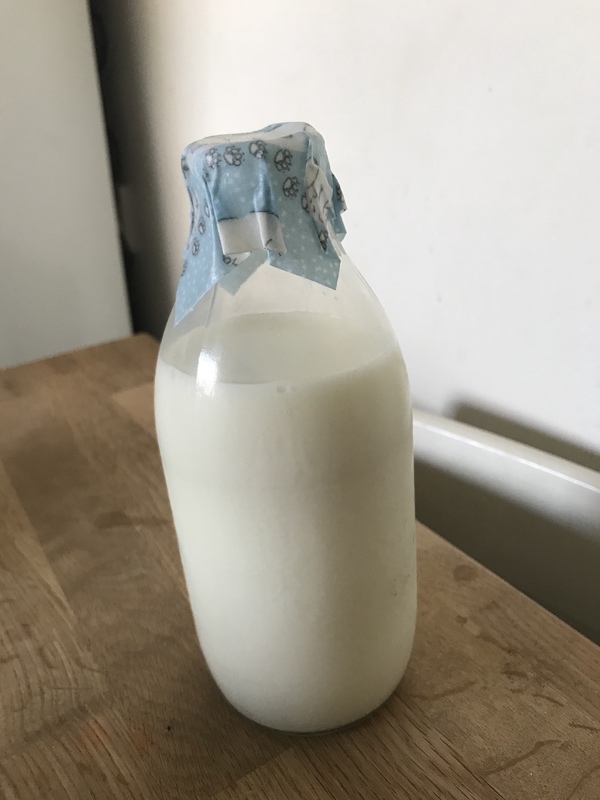 I wanted to make some wee squares to cover our glass milk bottles now we’re getting our milk delivered from a local dairy. The foil tops never go back on properly and mini wax wraps will be ideal for this. I gave them a baking tray each and they sprinkled pellets on the fabric, spacing them evenly and I put the trays in the oven. They were tasked with watching them like hawks as the wax pellets melt all of a sudden and it is time for them to come out. It takes 1-2 minutes. Super quick, means there was no time at all for them to get bored! When I pulled the trays out, helping again each boy took turns spreading the melted pellets all over the fabric. You can actually see the fabric absorb the wax so it’s a great visual for the boys to see which areas were covered and which weren’t. Then the fun part was quickly peeling them off the tray and air drying them by running around the kitchen like a pair of lunatics with mini capes. Next time I’ll stagger this stage as the two of them just caused carnage. Drying the wax wrap takes again literally 1-2 minutes and that’s it. Done! The boys both had a couple more goes and then I did a super size wrap which was not entirely successful and now I need to spend my evening cleaning soy wax off my oven door… sigh! We now have a fresh stack of wax wraps and I have something to cover the milk bottles with. Although the husband has just pointed out a single pint is never open for very long in this house so they’ll probably not be needed! At least we’ll have the option and no need for cling film whatsoever, so I think we can call this a win. These wraps work like cling film but the heat from your hands forms a seal around and over whatever it is your wrapping. Be it a sandwich, a bowl of pasta, half an onion etc. They can be used in place of cling film and are completely zero waste as when they’ve come to end of their life span they can simply be composted! Just to add these are only to be used with non Meat products as they can’t be cleaned in hot water only warm or cold. They just need wiping mostly anyway. I use ours to cover left overs, the end of a cucumber, or half a pepper and they’re perfect for cheese too. With the better weather coming I’m going to use them to wrap snacks and sandwiches so we can have a lot more picnics and al fresco meals in the woods! And milk bottles of course! Fab tutorial! I’ve shared your link over on my blog fb page, gonna make these for sure! Ooh thanks so much! I made some last year just before I started my blog and I needed some different sizes, they’re so easy to do! I’ve been meaning to do these for a while, so thanks for the tutorial! I’m having trouble finding a place online that stocks food safe soy wax pellets. Could you tell me where you got yours please?